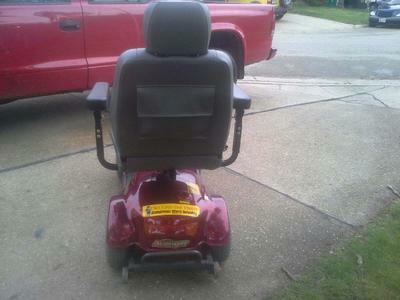 The re-conditioned, used Golden Avenger mobility scooter for sale is five (5) years old. 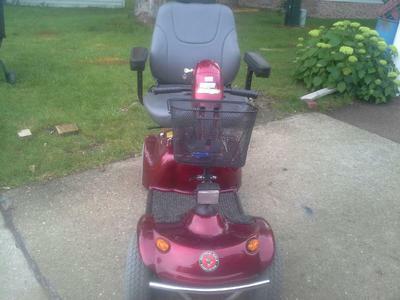 The Golden Avenger has a weight limit of up to 500 pounds and is in excellent condition with a brand new seat. The entire electric scooter has been reconditioned and it has had new batteries installed in the last 6 months. This is a nice electric scooter with a basket on the front and a storage pocket on the rear of the seat. 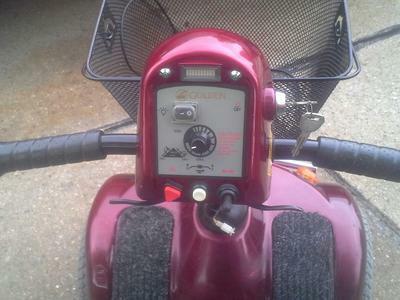 The Used Golden Avenger Mobility Scooter for Sale is in Marshall, Wisconsin which is 1/2 hour's drive NE of Madison, WI and my price is $2000.00 or you are welcome to send me your best offer bid when you e-mail me using the comments form provided by GoGoCycles Used Motorcycles for Sale. Possible delivery of the scooter chair locally for a small extra charge to cover my fuel costs. Happy scooting everybody and thanks for looking!